David C. Rosart, age 77, of Byron Center, passed away on Saturday, March 16, 2019. David will be lovingly remembered by his wife, Nancy; children, Emily Pitsch, Andy Rosart (Gina Abt); grandchildren, Olivia Pitsch, Gwen Pitsch; twin brother, Robert (Marie) Rosart; and nieces and nephews, Cathy, Debbie, Robert, and Charles. Dave was born in Miami, Florida on the 14th of December 1941. He has a twin brother Robert who he spent a lot of his childhood with, I’m sure getting into plenty of trouble. Their family raised Great Danes, which he really enjoyed doing and always had some good stories about. His Uncle Frank ran a charter fishing business and he loved to help with the trips out on the ocean. 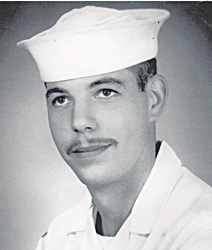 As he got older, he joined the Navy during the Vietnam War era. In 1963 he set out on the ocean again this time aboard the U.S.S. Hancock. He was part of carrier air group 21 and his unit name was VA - 212 nicknamed the Rampant Raiders. After his tour he was honorably discharged from the Navy. Shortly after that he moved to Michigan and married Nancy where they built a house and started their family in Byron Center. Dave started working at Herman Miller where he helped set up and run the printing department. He worked there for the next 31 years. During that time Dave and Nancy had two wonderful children, Emily and Andy. In his spare time Dave did lots of different things including - hunting, fishing, metal detecting, rock hunting, gold panning, antiquing, golfing, traveling and supporting his kids in all of their activities. He found many different things while metal detecting like coins, rings, necklaces and plenty of bottle caps and pull tabs. Some of the old coins he donated to the Byron Center Museum to be put on display. The whole family always looked forward to traveling in our motorhome. Every year we would plan a trip to somewhere in North America… never really knowing exactly where we would end up or how long we would be gone. Throughout all the trips we visited 46 states and almost all of Canada. We visited numerous National Parks, landmarks, lakes and cities from coast to coast. Sometimes trips lasted a couple weeks, sometimes it ended up being six weeks (a long time to be stuck in a motorhome). We always had fun playing games and spending time with each other. Another family favorite were the trips to Cedar Point amusement park nearly every year. Dad loved to take the kids on all the big roller coasters (mom was a little too scared to go on the big ones). Almost forgot about the trips to Indiana to get fireworks for the 4th of July. After Dave retired, he spent some of his time volunteering and helping out wherever he could. It is a little hard trying to right a brief paragraph about Dave when there are so many good things to talk about. He was a great father and friend and we could never thank him enough for everything he did for us. He will be greatly missed. Thank you, Dave. - We love you, your family.A memorial visitation will be held on Thursday, March 21, from 5 – 8 pm at Stroo Funeral Home, 1095 68th St. SE. Interment will be in Ft. Custer National Cemetery. Memorial contributions may be made to the Alzheimer's Association.